In addition to Edit Full mode, Photoshop Elements offers you other workspace views, tailored to the kinds of tasks people typically want to perform when editing photos. Edit Quick mode is designed to provide you with just those tools that you need to prepare a picture for its intended destination, whether it’s printing, onscreen viewing, or one of the other organizing items. Use this mode to make your pictures look good. You don’t find tools for adding text, painting with brushes, or applying gradients in Edit Quick mode. Rather, what you find is a completely different set of panels for balancing contrast and brightness, lighting, and sharpening, for example. This mode is like having a digital darkroom on your desktop, where you perfect an image like you would in analog photography darkrooms. To enter Edit Quick mode while you’re in Edit Full mode, click the Quick button next to the Full button on the Edit tab; the view changes, as shown in the following figure. Choose Quick on the Edit tab to switch to Edit Quick mode. Completely different sets of panels are docked in the Panel Bin. All the panels in Edit Quick mode are related to adjusting brightness controls, and they’re designed to improve the overall appearance of your pictures. In addition, all the Window commands for accessing panels are grayed out. While you work in Edit Quick mode, Elements insists on limiting your use of panels to just the ones docked in the Panel Bin. Moreover, you can’t undock panels from the Panel Bin by dragging them out, as you can in other modes. None of the other Elements tools are accessible while you work in this mode. Multiple viewing options are available. You select different viewing modes (such as Before Only, After Only, or Before & After) from menu choices on the View drop-down menu below the image window. If you want to return to Edit Full mode, click the Full button on the Edit tab. 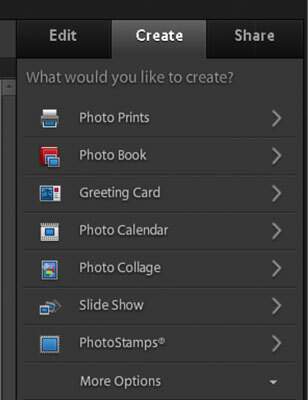 To organize your pictures for display in a variety of different ways, begin by clicking the Create tab in the Panel Bin. The panels in the Panel Bin change to support different creation options. Click one of the listed options for making a new creation or click the More Options button to select from additional options. 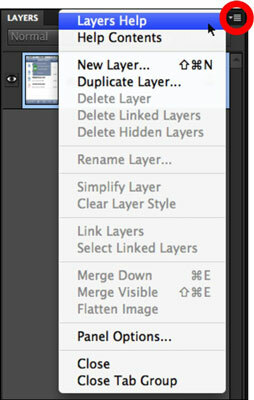 Click Create and then choose an option for the type of creation you want to edit. Most panels in the Panel Bin and the Project Bin contain an Options menu. Click the icon in the top-right corner in a panel and you find menu commands related to the respective panel. Click the icon in the top-right corner of a panel to open the Options menu.